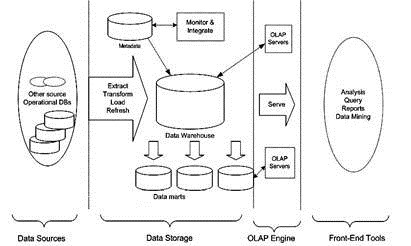 Online Analytical Processing OLAP is a data warehousing tool used to organize, partition and summarize data in the data warehouse and data marts. OLAP is an approach to respond quickly to multi-dimensional analytical queries. OLAP belongs to the category of business intelligence. OLAP finds applications in business reporting for sales, marketing, budgeting and forecasting, management reporting, business process management, financial reporting and similar areas. The output of an OLAP query is displayed as a matrix. The dimensions form the rows and columns of the matrix and the measures form the values. OLAP creates a hypercube of information. The cube metadata is usually created from a star schema or snowflake schema (to be discussed later) of tables in a relational database. The figure depicts the schematic representation of multi-tiered architecture of Data warehousing. As shown in figure the OLAP servers are in the third tier of the multi- tiered architecture of data warehousing. OLAP servers handle the data that is crucial for the management which is accessed through an iterative analytical inspection. The data warehouse dealers and few other researchers have extracted a general definition for OLAP which is FASMI. It stands for Fast, Analysis, Shared, Multidimensional, and Information. Let us discuss these characteristics in detail. · Fast: This refers to the ability of OLAP to respond to the user requests in less than 5 seconds. The response time for a complex requests would probably take 20 seconds. The speed is achieved by using various techniques like specialized data storage, certain hardware components, pre-calculations and so on. · Analysis: OLAP has the capacity of handling any business or statistical analysis for users. The most commonly used analysis techniques are slice and dice and drill down. · Shared: When multiple write access is granted, the system has the ability to maintain confidentiality and lock simultaneous update. The recent OLAP products realize the need for write access and are capable of handling updates from multiple users in a timely order. Shared also refers to the ability of the system to provide multiple user access without letting the files to duplicate. · Multidimensionality: It is the main feature of OLAP products. Multidimensionality requires organizing data in the format as per the organization’s actual business dimension. For example, in a marketing company, the dimensions maybe lined on dimensions like clients, products, sales, time and so on. The cells contain relevant data at the intersection of dimensions. Sometimes cells are left blank. For example, a client may not always buy products at all time frames. This is called sparsity. · Information: Refers to all the data and required information for users. The data capacity varies with factors like data access methods and level of data duplication. OLAP must contain the data which the user requires and must provide efficient data analysis techniques. Different techniques can be followed to attain FASMI objectives which include client-server architecture, time series analysis, object orientation, parallel processing, optimized data storage, and multi-threading.